Instruction - De website van rs-dh! Ron teaches all levels up to Grand Prix. It's possible to have a lesson with your own horse at our yard, or when you want to visit and have a lesson on one of our horses. In that case Ron has several schoolmasters who can do the upper level movements all the way up to Grand Prix level. In the lessons we focus to learn how you get the right feel for the horse and understanding the ins and outs of dressage by working on the basics. 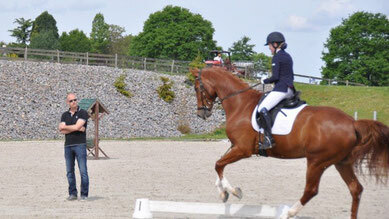 Because of the experience and eagerness to teach Ron learns the rider to develop a good feeling for the horse and become the best combination with the horse, as a result off this the horse will develop as the best athlete possible. Ron has many student who he supports, even on competition. On the picture he is working with his daughter Shannon on competition.